Conquer Fansipan peak properly. Do you want to challenge yourself? 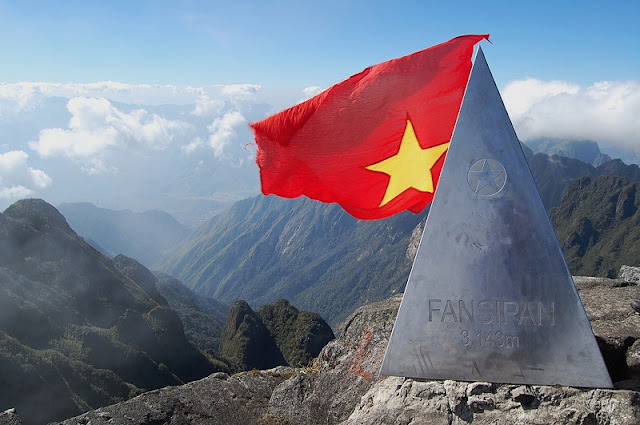 Mount Fansipan is the highest mountain in Vietnam and Indochina peninsula, located in the Hoang Lien Son mountain range. It was once only visited by adventure seekers fit enough to make the strenuous hike, but now this mountain offers a few different experiences for all types of travelers. Regardless of the new tram that brings people to the summit of this large peak, you should make the trek to meet travelers, experience adventure, and talk with locals. From Hanoi to Sapa. There are four options: bus, train, private car/bus, or your own rented motorbike. If you are really looking for an adventure and you have time to discover Vietnam, then make this trip complete by renting your own motorbike! Once you are in Sapa, the fun begins! It is very important to research weather and when to visit various places in Vietnam as the rainy season can put a gloomy mood on things. With Mount Fansipan, you will be trekking in part for the gorgeous views of the top and Sapa valley but you won’t see these views if it’s cloudy and rainy. You might also be freezing when you get there. For the most ideal conditions, make the trek between October and April. During the summer, it can rain and make the trail treacherous even with good hiking shoes. However, December and January can be quite cold, the peak has even seen some snow! If you are in Hanoi and have a flexible schedule, I suggest watching the weather in order to ensure the best experience. Sapa is a far hike in of itself, the trek even longer, so make sure the weather conditions are ideal. There are several options for all types of travelers that allow you to see the beautiful summit of Mount Fansipan. It depends on your desired level of adventure, fitness, and time frame. I will break it down for you. Treks range from one to four days. If you want to complete the trek in one day, you should be ready to go early with your things ready and you should be in good shape. I suggest the two-day, one-night option as it gives you ample time to complete the trek, allows you to converse and connect with fellow hikers and guides, and you can better acclimate to the altitude change. The three-day trek obviously gives you even more time, and if you haven’t exercised in a while or you feel reluctant as to whether the distance is too long, then choose this option. Tram Ton: This is a gradual trail that is most used by tourists, therefore it has the most people. The distance between the beginning point, at about 1,500 meters, and the summit is 11 kilometers. This trail can be accomplished in one day or two days. Keep in mind that while this is the most used trail, it is still physically demanding. Many travelers report taking the tram down because they are too tired to make the trek back. This can also save you some time on your itinerary. Sin Chai: This trail is shorter but it’s mainly for adventure seekers. It’s treacherous and hikers often report losing the correct path. The distance from beginning to end is about nine kilometers but different guiding groups take different paths. You may need two or three days to complete this trail. Cat Cat: This is the longest trail but it has the best scenery. The distance from the beginning to the summit is around 20 kilometers. This trail usually takes around three or four days to complete. *Do keep in mind that the Sin Chai and Cat Cat trail are considered dangerous. You can also choose to do a private or group trek. With a group, you get to make friends, have nightly conversations and entertainment with cool people, and have a social time. A private tour allows you to make your own plans (do you want to wake really early to catch the sunrise at the summit?) and set your own pace. If you don’t like hiking or your budget or body inhibits your adventure level, there is always the cable car option. To some of you, this Fansipan Legend Cable Car may also seem like an adventure since it spans 6,292.5 meters, making it the longest three-rope and non-stop cable car out there. Not only that, it also holds the record for highest elevation gain with 1,410 meters for three-rope cable cars. It sweeps through clouds with views over Muong Hoa Valley, and through the magnificent peaks of Hoang Lien Son Range. You still have to summit Mount Fansipan by walking about 600 stairs to the very peak after you exit the car. A roundtrip ticket costs 600,000 VND. For those of you who can’t decide whether to trek or ride through the clouds, consider both! Hike to the top and then ride the cable car down. Although this is a new modern car, it still provides sleek transportation to a place that used to be accessible only to those who could make the trek. Now every traveler can feel the true grandeur of this Sapa peak. Mount Fansipan is a rare adventure of Vietnam. Sapa is also a natural wonder and if you have time, you should definitely consider making the trek. You won’t regret it! Take an easy-going spirit, quick feet, and some water and be on our way!